Welcome to the debut of our newly redesigned newsletter! Don’t worry, we’re not going to make this about New Year’s resolutions or anything like that. We’ve simply come to the conclusion that there’s enough content to warrant more than one newsletter per month and wanted to change up the format. 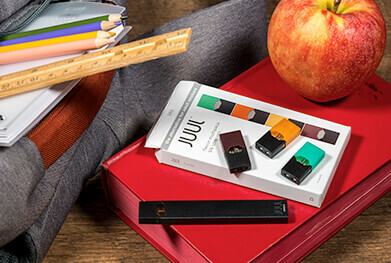 Read on for the latest, including info on lawsuits against JUUL Labs, allegedly defective military earplugs, and more. And let us know what you think about the new design! The popular e-cigarette maker JUUL Labs has come under some scrutiny lately over the way it markets its biggest product – the Juul. And with a certain amount of scrutiny, you'll typically find a lawsuit or two. The lawsuits filed against JUUL allege that it advertised its products as “the alternative to cigarettes,” implying that they are healthier and less addictive when it’s believed that Juul e-cigarettes actually contain the same amount of - or more - nicotine than cigarettes and aggravated many users’ addiction instead of helping them quit. These suits are being filed by both adults and the parents of teens who used the device – since the company also stands accused of marketing to underage users. And chances are that if you’ve been anywhere near a high school in the past year, you’ve seen some youngsters using the device. If you or your underage child has used Juul and become addicted, check out this page for more. If you served in the military between 2003 and 2015 and suffered hearing loss, the earplugs you used may be to blame. In July, defense contractor 3M Company settled a False Claims Act lawsuit that alleged its Combat Arms Earplugs were defective and caused many service members to develop hearing loss. According to court documents, the 3M earplugs, which were supplied to the military between 2003 and 2015, were too short and could loosen in the wearer’s ear, exposing him or her to damaging noises that could result in hearing loss or tinnitus. Now, attorneys believe individual lawsuits could help servicemembers recover money for medical bills, pain and suffering, and other losses. For more, check out our dedicated page. It has been reported that Wells Fargo wrongfully denied hundreds of individuals who qualified for loan modifications under the federal Home Affordable Modification Program (HAMP), causing many to lose their homes as a result. In 2018, Wells Fargo admitted that a software error caused it to deny borrowers who were entitled to loan modifications under HAMP – and then sent out checks to those individuals in an attempt to make up for their mistake. Many have complained, however, that the checks weren’t enough to cover the actual damage done. Additionally, it’s been alleged that Wells Fargo knew about the error three years before it decided to do anything about it. Attorneys are now looking to hold Wells Fargo accountable by filing class action lawsuits on behalf of those who lost their homes and suffered damage to their credit due to Wells Fargo’s error. Read more about the investigation here. Seterus Inc., a company that specializes in collecting delinquent home loans, is facing a class action lawsuit filed on behalf of people who fell behind on their mortgage payments. The suit alleges that the company sent out collection letters that falsely implied homeowners’ loans would be accelerated – meaning the full amount of the mortgage would be due – if they didn’t pay the money they owed within a certain time period. The ultimatum presented by Seterus, however, is allegedly nothing but a ploy to pressure consumers into making immediate payments. In fact, the lawsuit states that it’s Seterus’ own policy to never accelerate a loan so long as the person makes a partial payment within a certain time period. The law has plenty to say about what must be (or can’t be) in a debt collection letter – and false threats are among things that should never be included. For more on the case and a copy of the letter sent out, head over to this page. If you bought a Lenovo laptop in 2014 or 2015, you may be able to claim a cash payment because of the adware that was installed. Those who purchased Dial Complete Foaming Liquid Hand Soap between January 1, 2001 and January 2, 2019 may be able to take part in this settlement. If you own or owned a building (commercial or residential) containing NIBCO's Pex tubing, fittings or clamps anytime after January 1, 2005, you may be able to claim a piece of this settlement. In the latest post from our Class Action FAQs series, we take a look at the finer points of class action settlements. They can seem a bit confusing from the outside, so we covered some of the basics and answered the questions we most often receive on the subject. From settlement administrators to lost checks, if you have a question about a settlement, this is a good place to start. For months, attorneys working with ClassAction.org have been looking into lawsuits covering Amazon delivery drivers over potentially illegal pay practices – and now they’ve refocused their efforts. A number of lawsuits have been filed alleging that Amazon itself is responsible for failing to provide basic payroll training to the companies it contracts with to deliver its packages and that delivery associates are being robbed of proper pay as a result. If you work or worked for a logistics company or delivery service provider delivering packages for Amazon, a lawsuit could help you get back any wages, including overtime, that you may have missed out on. Visit this page for more information about the litigation.